However, there is structure present in a speech. The speaker must present evidence or examples to support their goals, whether their goals are to persuade, inform, or entertain. They may also draw conclusions, ask relevant questions, or predict, all based on their evidence and conclusions. In order for the speech to be successful, the evidence, conclusions, and predictions must be logically tied together to build a coherent argument. In a well-crafted speech, the audience will have no trouble following the thread of the argument, despite the lack of explicit structure. However, if there is more than a small amount of content in the speech, the audience may not have the ability to rank the importance of various ideas, or even to identify the key concepts. This is a diagram I created of the first half of the speech Viva Las Xmas [PDF, HTML] by Larry Harvey (2002), the founder of the Burning Man project. In the speech, he discusses some socioeconomic principles, and how they affect interactions between people in a marketplace economy, and also in the gift economy at Burning Man. 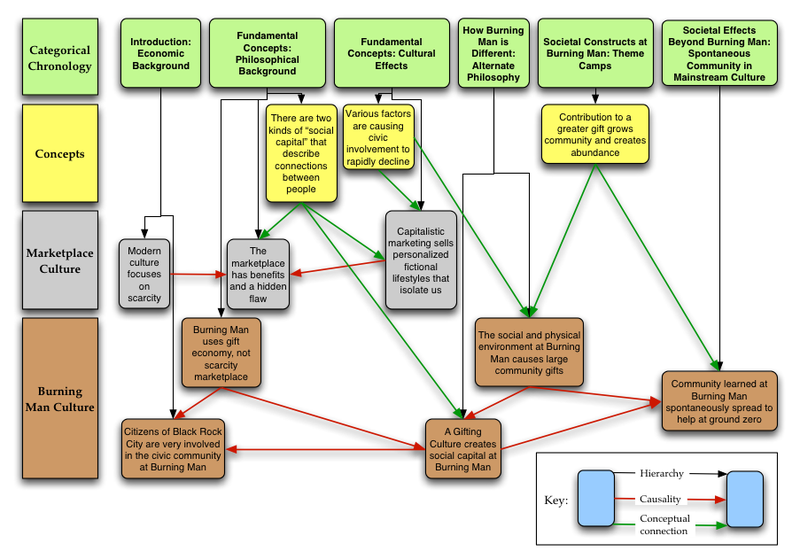 The diagram uses placement, color, and links to show not only the chronology, hierarchical, and topical groupings of chunks of the speech, but also causality and conceptual connections among the chunks. This has some significant consequences. Not only does the diagram immediately reveal the topical threads in the speech, it also makes the important concepts clear by virtue of their relatively high number of links to other portions of the speech. The connections, relationships, and implications that are implicit in the speech become explicit in the diagram, thereby conveying more complete knowledge to the reader, reducing the amount of raw information that they have to integrate, and making the actual message of the speech more accessible. This type of diagram could be constructed before the presentation of a speech, and then used to support the speech as it was being delivered. This would enable the speech author to emphasize the key points and make the speech easier to follow. 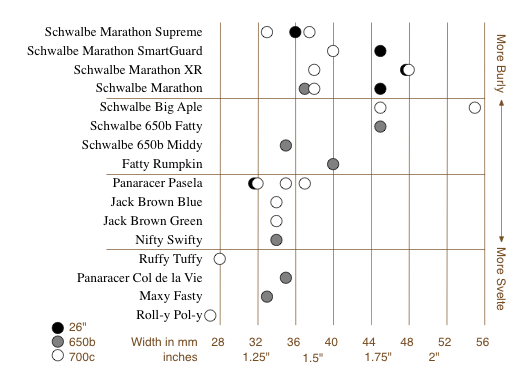 This diagram reveals six dimensions of complexity. I created this diagram in the fall of 2003. The diagram and the text of this post appear in my thesis. 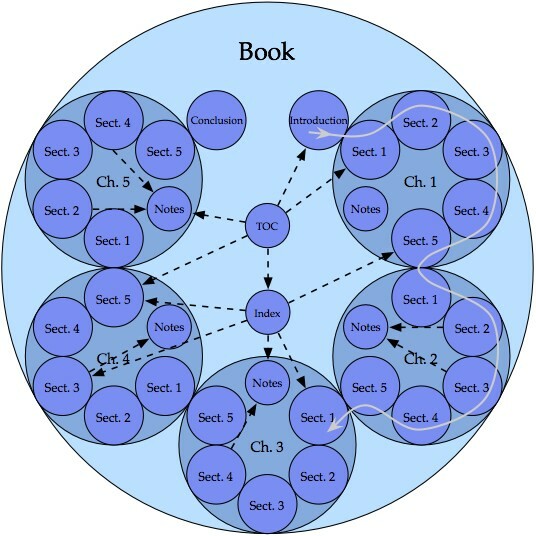 This diagram has been arranged to show not only the hierarchy, but also the intended use pattern of a typical, linear, non-fiction book. Continuity in the book is indicated by contact of the circles. The gray line, progressing in small and large clockwise arcs from section to section and chapter to chapter, demonstrates the linear progression of the content. The dashed black arrows show some possible non-linear paths that may be traveled by the reader to view content that is not part of the main linear flow of the book. The goal of displaying the use of the book, and not merely the hierarchy, has led to an atypical diagram that conveys more knowledge than the typical counterpart. I created this diagram in the fall of 2003. It appears in my thesis, and was selected to be supporting material for the book The Practical Guide to Information Design, by Ronnie Lipton.